Ginger Green Tea by Prince of Peace is so delicious!! Ginger Green Tea by Prince of Peace is a very good tea, from a tea drinker. Drinking Ginger Green Tea by Prince of Peace is very refreshing in the morning. Enjoy the warm‚ soothing benefits of Ginger Green Tea from Prince of Peace® and its antioxidant properties may help prevent free radical damage too. Ginger may alleviate stomach conditions‚ like morning sickness‚ motion sickness‚ gas‚ nausea and colicky conditions. It may also work as an appetite stimulator. Ginger has a distinct fragrance and flavor‚ thanks to its gingerol content. Gingerol is the bioactive compound in ginger to which it owes its medicinal properties. Ginger has immense anti-inflammatory effects and serves as a condiment to spice up foods. When added to tea‚ it works as a medicine and may soothe the throat. By regulating blood lipid levels‚ ginger even promotes a heart healthy lifestyle. Green tea in this herbal beverage blend from Prince of Peace® is full of antioxidants and may promote healthy brain function and fat loss. Licorice may soothe throat‚ and relieve heartburn and indigestion. It may also alleviate chronic inflammation of the stomach lining‚ thin mucus secretions and reduce cough. Ginger Green Tea from Prince of Peace® may just be your choice for soothing your stomach and easing throat conditions. Ingredients: Ginger‚ Green Tea‚ Licorice‚ Stevia. Place one tea bag in a 6 oz cup‚ add boiling water and let it steep for 2 minutes before drinking. Ginger Green Tea by Prince of Peace greatly helped me through my last pregnancy. 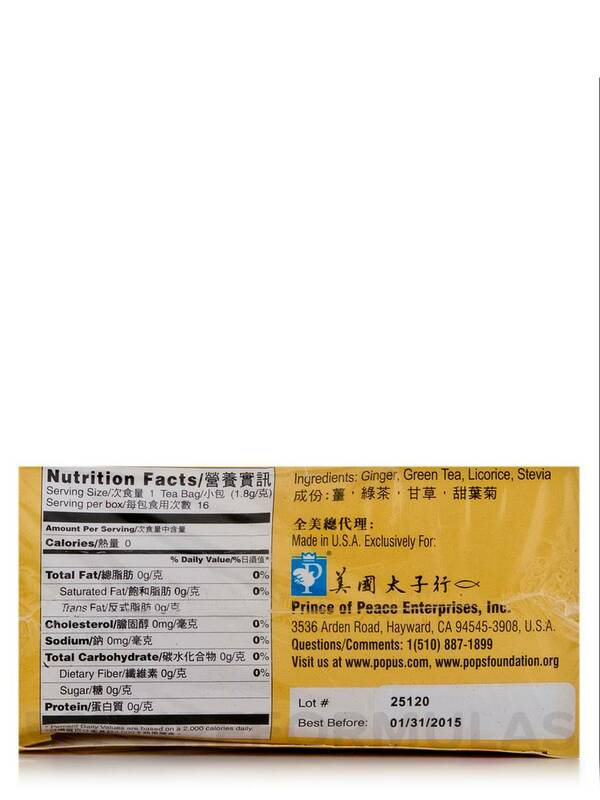 Ginger Green Tea by Prince of Peace has barely any taste of ginger or green tea. Switched from black coffee and I really like Ginger Green Tea by Prince of Peace, it's refreshing and gives me energy without the crash or jitters from coffee. Ginger Green Tea by Prince of Peace is a great way to get your anti-oxidents and soothe and warm your stomach. 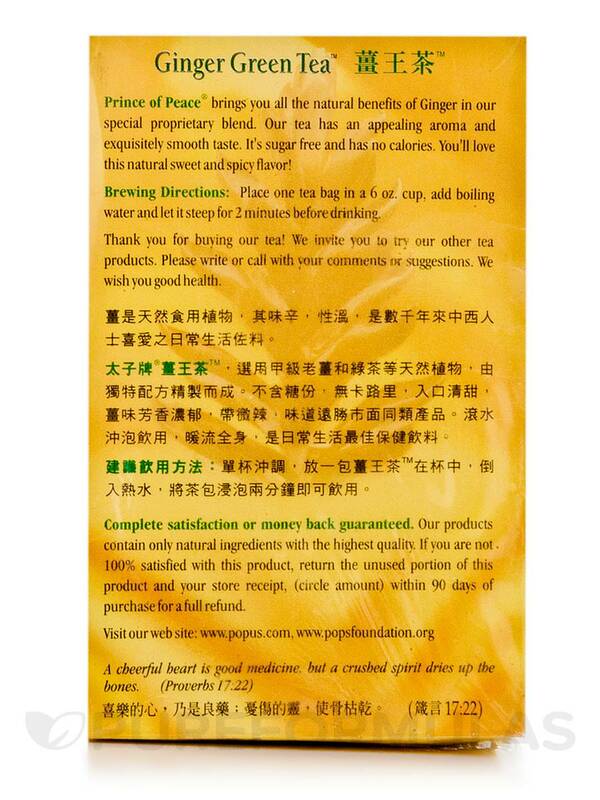 We never really liked ginger as much until we had Ginger Green Tea by Prince of Peace. Now, this is all we drink. The flavor and health benefits. I hardly ever take out my teabags from my mug since I like my teas strong. I left the teabag in my mug the entire time and Ginger Green Tea by Prince of Peace was still very weak. 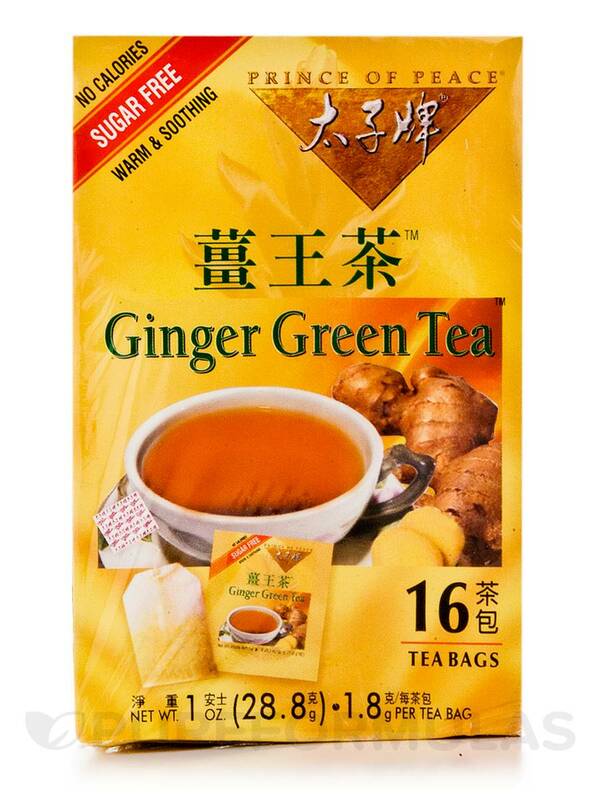 I like the ingredients and the benefits of green tea and ginger. The taste was very faint but wasn't bad either. This tea is too weak. I may have to use two tea bags instead of one. I love Ginger Green Tea by Prince of Peace. PureFormulas.com is the only local person with it. Ginger Green Tea by Prince of Peace tastes very good! Never had ginger tea before. It was nice and my nurse told me it have good healthy benefits as well. hi, is this tea decaff? Thank you for reaching out to us, Abraham. No, this tea is not decaffeinated.